Over this past year, my eight-year-old (now nine-year-old!) became increasingly interested in robotics. The first robot he learned about was Jibo because my husband was watching videos about this little gadget that might someday be a standard household item. My husband learned about it through all the tech sites and podcasts he listens to, and he showed it to us because he thought it was cool. Well, my son had never seen a robot before and suddenly he wanted to know more. My son was already an avid Lego fan. He has sat for six hours at a stretch putting together what looks like to me a complicated and tedious Lego kit. He has been building toys and other cardboard creations for a very long time, and he does indeed seem to have an “engineer’s mind.” (So unlike his mom and dad!) 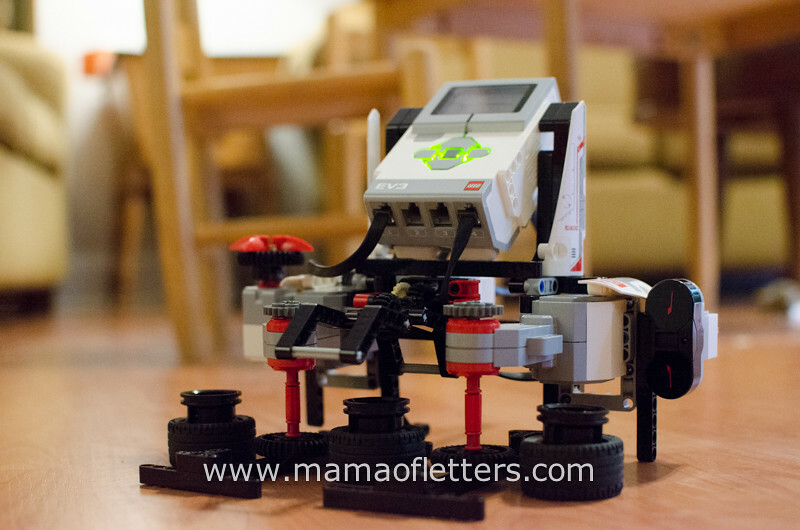 We wanted to support our son’s interest in robotics, so my husband did some research about robotics kits, and we learned about the Mindstorm EV3 kit and some others. But it was expensive, and we weren’t sure just how interested our son was in robotics yet. 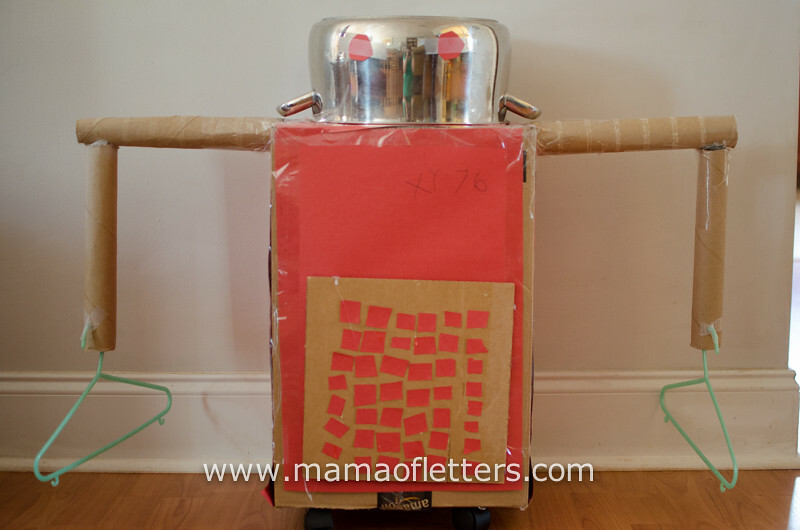 Technically, this was my son’s first robot. 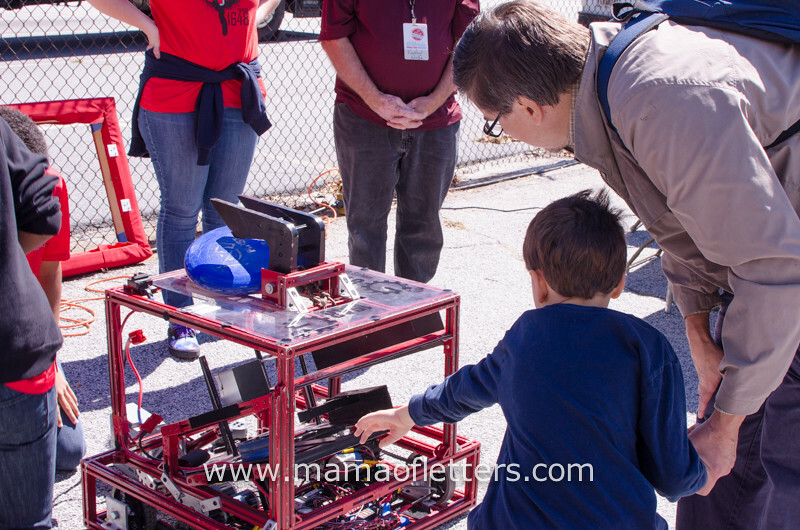 To help gauge our son’s interest, we took him to the 2014 Maker Faire in Decatur, GA last October. We knew he’d get to see some robots up close and maybe play with them too. 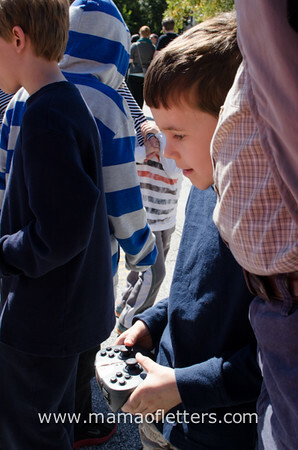 Indeed, there were lots of robots at the fair, and my son was able to try some out. He had a blast. While we were at the fair, my husband and I took the opportunity to ask some Georgia Tech students what they recommended for young kids interested in robotics. They mentioned the Lego robotics kits and one other one. Since our son was already familiar with Legos, the Mindstorm kit became a good choice for us. Indeed, many of the robots at the fair were made with Legos! 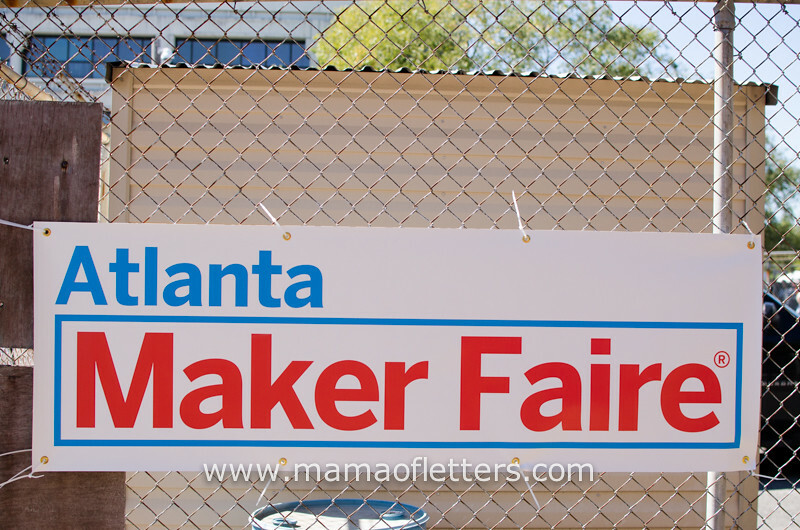 We also learned about hacker spaces and maker groups while we were at the fair and that there are a couple of these places located near us. This is not something we have tried out yet, but it may be another possibility to try someday. Ever since, he has said he wants to be an engineer. He also said once that he doesn’t think he wants to be just an engineer. We have let him know that many bio-engineers spend most of their day inside a building with no windows. It’s something to consider. But engineering is a huge field with many possibilities, and as he develops this and other skills, such as pottery and piano, you never know where his interests will intersect or compliment each other. So we feel it’s our duty to support this interest in whatever way we can for however long it lasts. 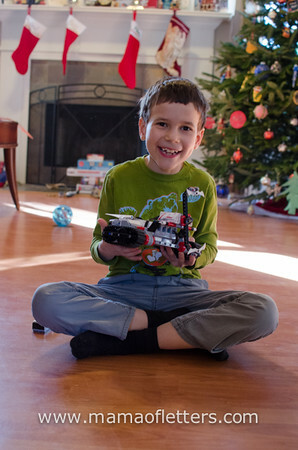 We wanted to get him the Mindstorm EV3 for Christmas, but since it was an expensive gift, we asked my in-laws and mother, if they might want to contribute instead of giving him a toy. They did. (Thank you!!!) I think it was certainly a gift that will have a longer shelf life than anything else we could have given him. 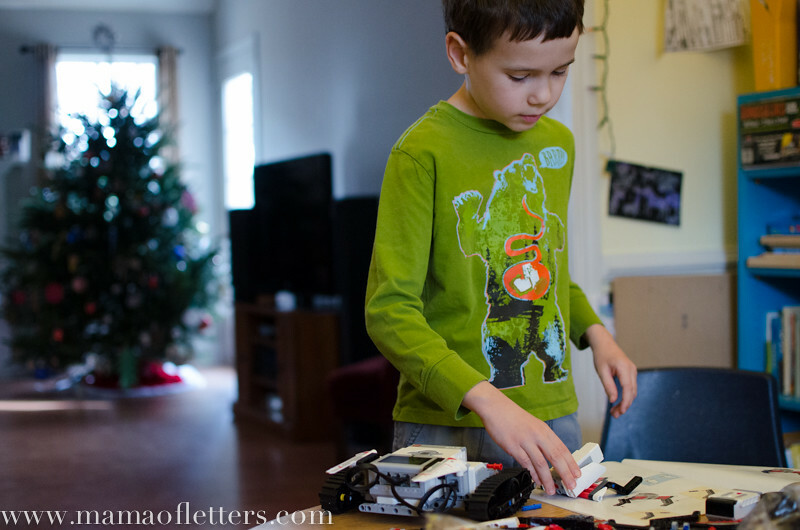 He has been extremely responsible with the robot, taking care to keep the pieces separate from his other Lego kits, and he was also okay with receiving very little else that holiday. Though I was worried he might lose interest in it over time, he hasn’t. Over the course of the year, he has built every robot whose instructions came with the software, and he has built a few others developed by Lego fans. He has watched YouTube videos to learn about the programming, and he has experimented with making his own programming for the robots. It’s not something he works on everyday or even every week, but he always goes back to it, and we’ve amassed quite a nice collection of photographs of his work. My son’s latest robot plays a “Which tire is the ball under?” game with you. It got to a point when I felt he needed more instruction, and we weren’t finding easy tutorials online anymore. I wanted to get him into a robotics class. Well, I searched in vain for weeks, and I couldn’t find anything closer than Atlanta, which is a bit too far for us to travel for a class. Finally one day my husband sat with me one afternoon and we did all kinds of Google searches. That’s when we found Engineering for Kids of Northeast Georgia. 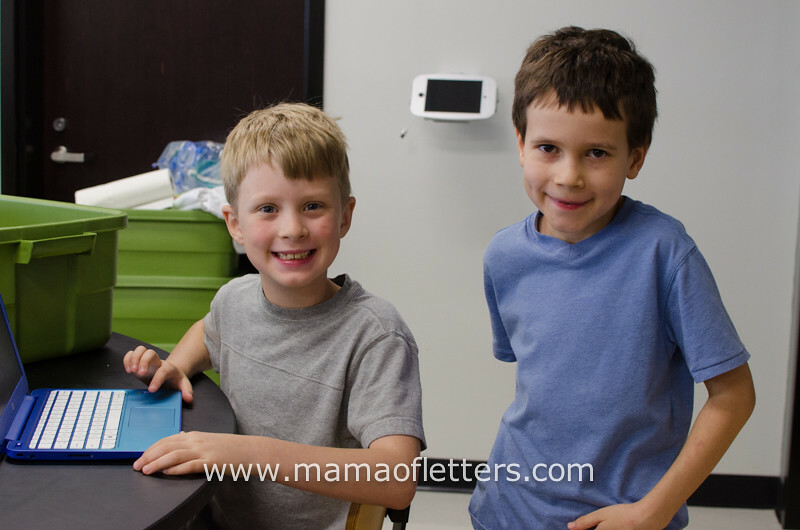 At that time, they didn’t have a robotics class, but we decided their STEM Club would be a good a match for our son, and later I was happy to find out they were doing a robotics summer camp (close to us!). So my son recently attended that, and he was happy to have one of his friends in the camp with him too. So this is where we are so far with his love of robotics. He just turned nine-years-old, and his interest is still strong and doesn’t seem to be going away. We’ll continue to support it any way we can, and I’ll be sure to let you know how it’s going too. Lego Mindstorms is great! I bought it as a gift for my husband, who is an electronic engineer, and he loves it as much as the kids. So, I would agree, it has the potential to be a very long-lived toy! That’s great to hear! Thanks for your comment. What a great post! my 9-year-old is expressing a similar interest and I am taking notes on your discoveries. Thanks for all the great ideas! That is awesome! I am currently searching in the Kennesaw Acworth area for robotics programs! My 14 yr old has an Ev 3 but has executive functioning difficulties and only reads at a 4th grade level, but he loves robotics! I need to find a program to get him in as he is in a small private school that does not offer these types of things.